Aging athletes don't have the agility they had in their youth. Minor injuries accumulate and become major ones. And by the time they hit their mid-30s and 40s, they're considered geriatric -- that's the conventional wisdom. But recently, middle-aged athletes have defied the tolls of aging, returning to competition and whizzing past their junior rivals. "Forties is the new 30s for physiological capacity," said Scott Trappe, director of the Human Performance Lab at Ball State University. "We're going to continue to see people do well into their 40s -- no question." Seven-time Tour de France winner, Lance Armstrong returned to the premier cycling race after three and a half years in retirement. The 37-year-old cyclist is currently ranked third in the competition. "Passport says I'm old but I feel pretty damn young," Armstrong wrote on Twitter. 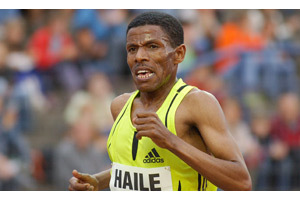 So move over, Gen Y. Ethiopian runner Haile Gebrselassie broke the world record for the fastest marathon in September at the age of 35. And at last summer in Beijing, veteran swimmer and medalist Dara Torres won three silver medals including the 50 meter freestyle. She was 41. "By yesterday's standard, that's an old athlete," said Trappe. "The paradigm is shifting -- that's not considered as old as it used to be." Elite athletes such as Torres, Gebrselassie and Armstrong, can surround themselves with a crew of nutritionists, physiologists, chiropractors and experts who dispense the latest technology and advice. "It's come down to some of the finances involved in sports that allow athletes to train year-round and later in their careers," Trappe said. "In addition to the nutrition, training, sleep, they have a staff hired to manage their overall health, flexibility, well-being, nutrition that contributes to performing better." But it takes more than a crew of scientists. Torres' success stems from her true enjoyment of swimming and the judicious use of her energy, said Michael Lohberg, her swim coach of two years. "Obviously the body deteriorates a little bit at that age, but you make up for other things," he said. "If you take care of your body and you enjoy what you're doing, these are the two major parameters that can keep you going. If you run the body down, train too hard at an early age, or you ignore injuries, you get injections to stay fit, then you have trouble." The ability of an older athlete to stay competitive against the younger ones varies by sport, said fitness experts. In a physically draining sport that's as punishing as football, aging bodies take longer to heal, Trappe said. Of course, there are exceptions. Quarterback, Kurt Warner at 37, led the Arizona Cardinals to the Super Bowl in January. In women's gymnastics where younger, prepubescent girls challenge the laws of gravity, Oksana Chusovitina, 33, beat most of them to win a silver medal for the vault in the 2008 Olympics. "It's good news-bad news after a certain age," said Carl Foster, the director of the Human Performance Laboratory at the University of Wisconsin La Crosse. "Thirty is the watershed for lots of sports. You start accumulating injuries. By the same token, the good things are you've practiced, your skills are at a high level, your knowledge of sports is high and there is cumulative conditioning." To train, Torres swims less compared with her earlier days. Essentially, she works smarter, not harder. "As a result of that, we were able to keep the technique at a very high level," Lohberg said. "She's flawless all the time. I have to correct very little. And she can go relatively fast in meets when she has to." Torres is probably not at the peak of her strength today, but "she's stronger in terms of swim-specific strength," he said. "She's able to accelerate in the water, to have snappy movements in the water. She's little bit quicker moving through the water, rather than just having power." Foster agreed: "It's not that they're stronger. They're better at translating strength to propulsion." "You don't see endurance athletes win at age 20," he said. "The Tour de France takes years to mature the body to tolerate that level of training and those events." The maturity also means a greater mental mastery of the sport. "It's a dynamic interplay between knowing more and executing better, but you may not be physically as strong," he said. "When you're young, you can afford to do stupid stuff. You have remarkable physical skills." But not all athletes return to their glory days -- even the great ones. Unlike his first comeback to professional basketball, Michael Jordan at age 38 "didn't have the same explosiveness," when he returned to play for the Washington Wizards in 2001," Trappe said. Jordan retired two years later. With age, the maximum heart rate decreases. This means the person has reduced endurance for intense, aerobic workouts. Male athletes have lower levels of testosterone, the hormone that helps build muscles and aids in recovery. The flexibility of the muscles and their ability to recover after intense workouts diminishes. "Forty-, 50-, 60-year-old athletes can do single training sessions, but they can't do it day after day after day," Foster said. "When you're 18, you can recover from anything." But that's no excuse to stop exercising, physiologists said. Even for non-elite athletes, research has shown steady physical activity is a fountain of youth. Activities such as walking, swimming, riding a bike, improve the heart and circulatory health and reduce age-related muscle loss.